Tessa Afshar’s “The Bread of Angels,” is story of a Lydia, one of first European convert to Christianity. 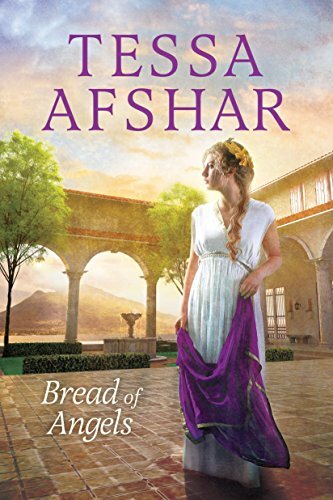 It is a testament of resilience and faith and through it Afshar demonstrates her ability to weave a dynamic story around biblical figures. First mentioned in Acts 16, Lydia is a seller of purple encountered by Apostle Paul. Although her mention in the Bible is brief, Afshar was able to expand her story to delightful heights. What surprised me most about this story was just how complex and dynamic Afshar was able to make Lydia. She was resistive and clever, running a dye business in Ancient Rome, a world that hardly condoned a female merchant. As Lydia’s story continues, her strength seems to flourish. The more I read, the more I liked her as a character, with Afshar creating a heroine I could both admire and understand. Afshar succeeded most not only in developing Lydia, but in writing skill alone. The scenery, characters, and historical significance contained within the story left me in awe of how carefully crafted the whole package was. As someone who does not read a lot of biblical fiction, I found myself immersed in a story where I want to know more about these figured from Acts. It contained truths not only on faith but on being human. As Lydia grows and develops throughout the novel, she comes to question her life and her old way of believing, and learning to trust and love in new ways. Both the character growth and romance that she experiences as she finds her way to Christianity were written from a place of strong emotional depth. What Afshar succeeds in most is creating this well of emotions that invites the reader to not only witness Lydia’s story but to take part in it themselves. I fell in love with the characters, the writing, and the scenes, but I still found myself struggling with plot. From what I understand, Afshar created this account on part historical and fictional truths. This limits what can be done with plot, but even so, I still felt the plot was disjointed at times. There were so many times when Lydia would encounter obstacles and overcome them with little to no character growth as a result. Other times, small events would happen that would significantly change both Lydia and the plot of the story. The time-skip at the end was particularly jarring. While I understand this purpose of this, it was hard to accept as a reader so suddenly. Due to this, the plot seemed disjointed at times, and made the climax seem harder to reach. Had the plots been kept simpler, much like Afshar’s simple yet beautiful writing style, I could have really fallen for this novel. Despite my hang ups on the plot, I still found this story to be beautifully written. As I said before, I tend to avoid biblical fiction, and was surprised that I found myself liking this work so much. Afshar proved that she has talent, and crafted a work that represents the best parts of writing – the emotional depth, the attention to detail, and the enduring faith of an incredible protagonist. Anyone who enjoys both biblical fiction and historical fiction could be taken in by this novel. Even those who stay away from the above would find liking in this, as the story and characters come to life off the page, making the reader want to know more.